One of the natural Wilbur-Cruce breeding groups was started in May of 2001. The "Stronghold Herd" is named after the famous Cochise Stronghold in the Dragoon Mountains. The Apache Indian chief Cochise and his band roamed the Dragoon Mountains until the early 1900's. The project is facilitated and managed by a ranch in the Dragoon Mountains. Several of the foundation mares and a foundation stallion range free on 1,000 acres of private ranch land. 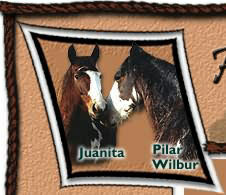 We thank Dr. Phil Sponenberg from the American Livestock Breeds Conservancy for reviewing our program and the individual horses "in the field" in February of 2001. In 2009 we have various natural breeding groups in Arizona, New Mexico, Nebraska and Colorado. Some people interested in starting a small breeding group have asked if one has to have a big ranch to get involved in the breeding program. The answer is No! We have very successful horse breeders on the 5-acre homestead or less, who are raising a couple of foals every year. At Heritage Breeds Southwest, our foals are ponied out in the mountains to get lots of exercise. They know mountain bikers, crowds of people, horse trailers and many visitors to the corrals. The horses do well in either setting as long as they are not alone. They are very social and prefer living in a herd, even if only two horses plus the humans. If you are interested in getting involved in the breeding program, please email us.